Used clothing is a huge business in Africa, you find sellers of previously owned items on almost every street. Recently when walking into Kibera I was surprised to see a golf shirt that bore the logo for the Ritz-Carlton in Laguna Niguel, CA. This chain of hotels is known worldwide for its luxury and this particular property is a bastion of wealth and privilege on the opulent Southern California coast. 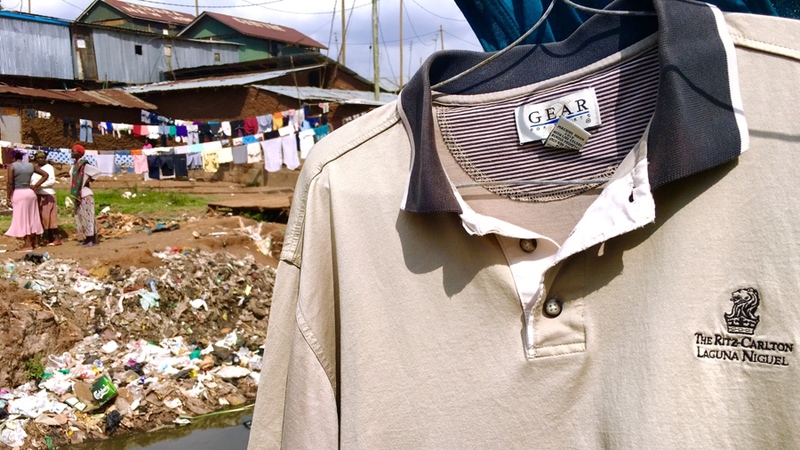 While looking at this shirt against the backdrop of the Kibera slum I was drawn to consider the contrast between the first owner and the next owner of this garment. The first owner likely lived a life of wealth, privilege, and power. They enjoyed the luxuries of life and seldom experienced want or need. The new owner of this shirt will live in one of the worlds largest slums, will be impoverished, ignored, and powerless even in his own community. The new owner of this shirt will feel want as a daily companion. Luxury will never enter his mind, only the constant struggle to survive. What a dramatic contrast between the 2 owners of this shirt. I walked away that day with two pervasive thoughts. The first involved responsibility. You may or may not be a regular guest at the Ritz-Carlton's of this world, however, as a resident of a western culture you are in a position of extreme privilege in contrast to the rest of the world. This privileged position should demand a generous heart on our part. In the words of Jesus, "to whom much is given much is required." My second thought was about perspective. I can imagine how much the original owner of that shirt enjoyed his foray into the world of luxury. Perhaps how much he wanted to buy that logo shirt and enjoyed wearing it to impress other. However, today that shirt no longer carries an aura of luxury or privilege. It reminds me that every possession we have will one day rust, tarnish, or decay. We must be diligent to remind ourselves that the only eternal investments are those made, in people, for the sake of God. I think the phase "putting on the Ritz" will forever have a new connotation for me.